I love making my own salad dressings. I can make a good Caesar salad (although the emulsification is a bit tricky with a creamy Caesar). But I am not an oil-and-vinegar kind of girl. I like unusual flavorful salad dressings. You can make a salad dressing with almost every kind of fruit - I've used strawberries, blueberries, oranges etc. One of my favorite salad recipes is one I developed as a variation of the "caramelized apple salad with blue cheese, black walnuts and spicy orange vinaigrette" in Bobby Flay's Mesa Grill Cookbook. His version of this salad, which looks and tastes quite different from mine, is served at his restaurant Mesa Grill in Gramercy. They key to the dressing is a fruit juice reduction - the dressing uses orange juice in his salad, but requires that you boil away the juice for about 20-30 minutes until it is a thicker, stickier, reduced liquid. 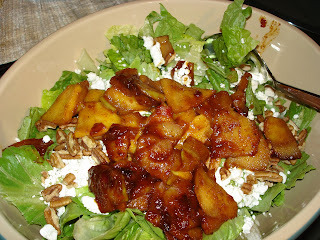 Here's my adapted recipe for the caramelized apple salad that I love. This was our dinner tonight. Then puree all of these in a blender to make the dressing. Add the olive oil slowly at the end and blend until emulsified. Next peel 2 granny smith apples. Caramelize these apples by sauteing in about 1/4 cup of the dressing. The strain the excess liquid. Cool the apples before adding to the salad. This salad should serve 2 as a dinner salad, or 4 as an appetizer.